By day, J.M. Hirsch is the food editor for the Associated Press, but each morning, he embraces his unofficial gig as an expert lunch packer. 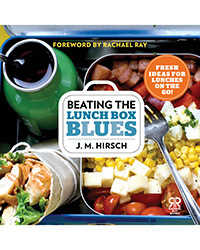 After years of making delicious, easy and fun meals to-go for his son, Parker (like a Star Wars–themed egg sandwich, the Obi Wan-wich), Hirsch is sharing his wisdom in a book called Beating the Lunch Box Blues, which hits shelves September 3. Based on his blog LunchBoxBlues.com, Hirsch’s book (he calls it an “un-cookbook”) features great ideas for superfast boxed lunches, gorgeous annotated photographs and 30 fast dinner recipes that yield strategic leftovers. Here are six of the brilliant tips from his book.